Silloth owes its name to the monks of Holme Cultram Abbey, a few miles to the south east, who cultivated the land, created a salt industry and encouraged the local people to farm the Solway Marshes. A settlement grew at Silloth; its name being derived from the ‘lathes’ (or barns) which were used to store the grain and located close to the sea, ie: ‘Sea Lathes’. Originally, Silloth was a small community of a few farm houses and was noted as a safe anchorage for ships during storms. It was in the mid-19th Century that the Carlisle and Silloth Bay Railway initiated the development of Silloth as a town. 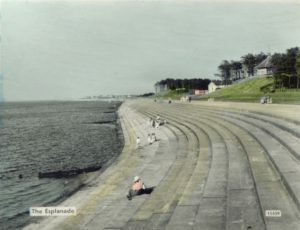 An eminent physician declared ‘the air to be cleaner and more health giving than anywhere else’, and coupled with the large grand hotels that were built to accommodate visitors, Silloth became known as a Victorian seaside resort. 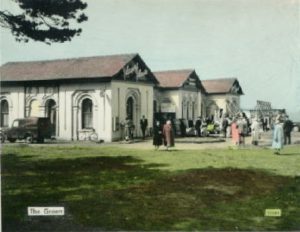 Victorian visitors to Silloth would make use of the Bathing Establishment (now the amusement arcade). The list of baths that were available included – Hot, Cold, Shower, Swimming and Plunge baths. Along the beach there was also a supply of bathing machines. These were little wooden huts on wheels pulled into the sea by horses. Visitors changed into their bathing attire inside and were able to bathe without the inconvenience of walking to the sea. People, known as Dippers, would coax and cajole nervous bathers out of their bathing machines into the water. The Pier, once adjacent to the West Beach, was completed in 1857. It was 1,000 ft long and 25 ft wide. It was free to visitors, fishermen and for boating. Steamboats left daily for Liverpool and twice a week for Dublin, The Isle of Man and Whitehaven. There was a railway along its length to carry passengers and goods to and from Silloth Station. During World War Two, lack of use led to rot and the pier was washed away by the sea. The Marshall Dock was opened in 1859 and adopted by the Silloth Bay Steam Navigation Company Ltd. In 1879 the dock entrance collapsed trapping 20 vessels inside. 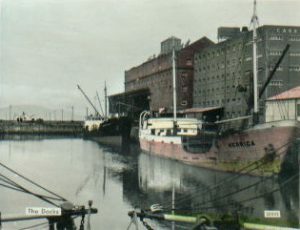 The New Dock was opened in 1885 and the Marshall Dock became a tidal harbour. Much of the material excavated was deposited nearby and it became the basis of the golf course opened in 1892. The Convalescent Home or Sanitarium was built in 1862 for people requiring ‘unequalled salubrity’ or pure Silloth air. It was built to give poor people who had fever an opportunity to recuperate. The monks of Holme Cultram developed a small port at Skinburness to export wool from their extensive flocks. In the 13th Century there was a considerable market town at Skinburness established by a charter of Edward I, who used the town to supply his army on its Scottish expeditions. Unfortunately, violent storms washed away the road and village and the Abbot applied to the Crown in 1305 to hold a market and fair in Newton Arlosh instead of Skinburness. For a more detailed insight into Silloth’s past turn to “Silloth-on-Solway: A Potted History”. Discover Silloth’s links with the RAF and the trials and tribulations of “Tommy Legs”. “Silloth-on-Solway: A Potted History” is available from: Silloth Tourist Information Centre, Solway Coast Discovery Centre, Liddell Street, Silloth, Cumbria.